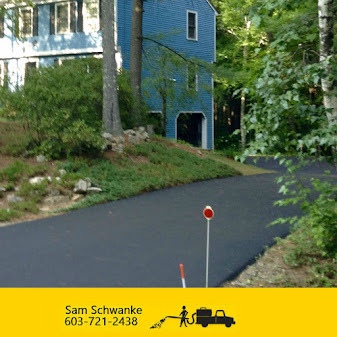 Quicks FAQ's of Seal Coat a Driveway in New Hampshire with Sam Schwanke ~ Seal NH - One Driveway at a time! That answer just depends how poor the asphalt is. If it has not been sealed a long time than it is good to do two coats. An expert will give his advice when he comes to do the price quote. What if a little sealant gets on my lawn? 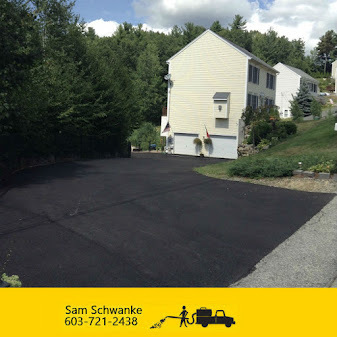 How long should I stay off my newly sealed asphalt driveway? We recommend you stay off the driveway for 24 hours. You can walk on it almost immediately, but it is good to keep all cars off for 24 hours. In cold conditions we recommend you stay off for 48 hours. Why are their tire marks in my newly sealed asphalt? For about 30 days it is normal for some of the driveways to get tire marks to appear in the coating. These marks blend away after a few weeks. These temporary power-steering marks can be reduced by making sure you always keep the wheel turned while moving. What is the Crack Repair Process? 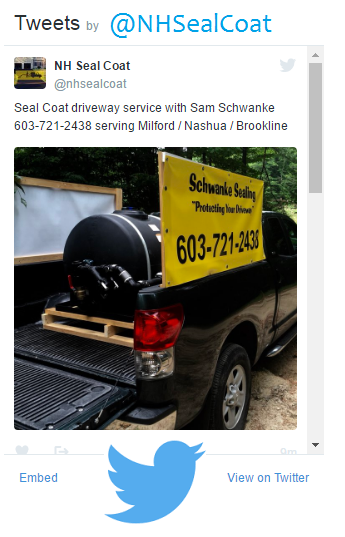 Schwanke Sealing uses a cold patch repair that thoroughly fills the cracks and stops them from spreading. We clean out all the debris from the cracks and than fill in the cracks. Will Having Crack Filling/Repair done, make the Cracks in My Asphalt Disappear? No. the crack filler will still be visible even if it is seal coated over. The crack filler is a thicker coat and you will still see where the cracks appeared. However, if you do not fill your cracks than your driveway will deteriorate even faster. Cracks lead to pot holes and potholes lead to tearing up a driveway and redoing it. 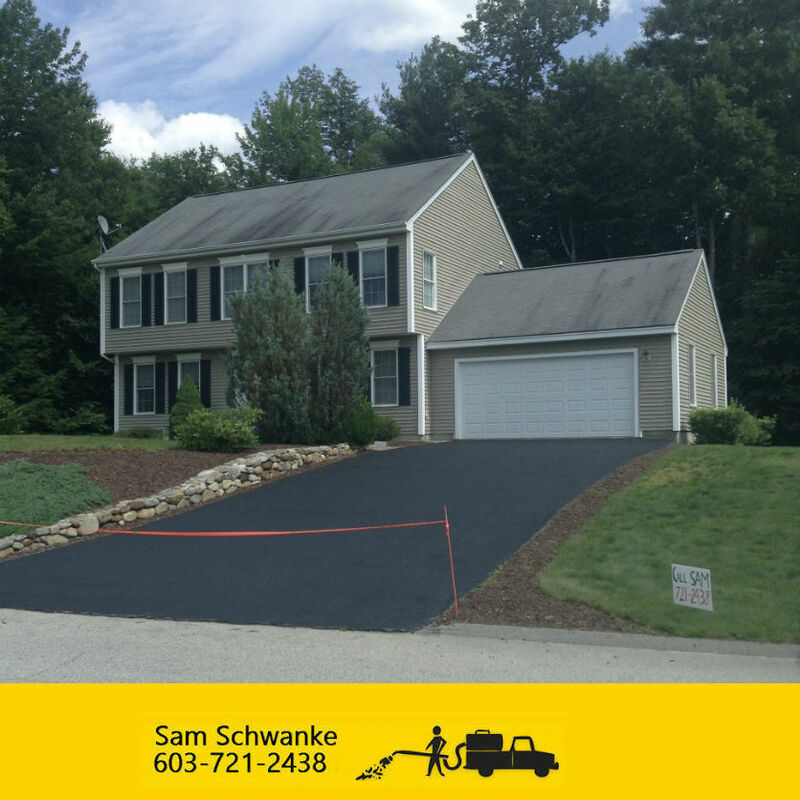 Do I Need to be Home When My Driveway is Sealed? No, but if you are not home, than we need you to make sure all cars are off the driveway and make sure nothing is within 5 feet of the driveway. Such as, vehicles, basketball hoops, and flower pots.